Don Coxe has four decades of institutional investment experience in Canada and the US. As a strategist and investor, he has been engaged at the senior level in global capital markets through every recession and boom since the onset of stagflation in 1972. He has worked on the Buy Side and the Sell Side in several capacities and has managed both bond and equity portfolios, and served as CEO, CIO and Research Director. He now distributes his views and recommendations on the global capital markets to institutional clients through The Coxe Strategy Journal, and conference calls. Until October 2016, he was advisor to the Coxe Commodity Strategy Fund and the Coxe Global Agribusiness Income Fund—two closed-end investment funds traded on the Toronto Stock Exchange. As Strategy Advisor for BMO Financial Group from 1992 until 2012, he was frequently named as a Top Gun portfolio strategist by Brendan Wood International; in 2011, he was given a Lifetime Achievement Award after having been ranked Number One in the 2007, 2008 and 2009 surveys. He also received the Lifetime Achievement Award from Canada’s Financial Post. 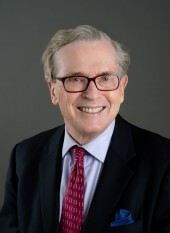 As CEO of an investment management firm owned by Mutual Life of Canada managing both bonds and stocks, he was consistently ranked among the top managers in Canada over the years from 1972 to 1983, when he moved from Waterloo, Ontario to Bay Street as Strategist and Research Director, and then to Wall Street and ultimately LaSalle Street. Prior to entering the investment business, his eclectic background includes serving as an editorial associate of National Review magazine in New York, practicing law in Toronto, serving as general manager of the Ontario Federation of Agriculture, and General Counsel of the Canadian Federation of Agriculture. He has been a featured contributor to Maclean’s, Canadian Business, The Globe & Mail, and The Financial Post. He is the author of The New Reality of Wall Street, published by McGraw-Hill in 2003. Mr. Coxe has lectured at actuarial conventions on pension policy, based on his experience for six years on the Canada Pension Plan Advisory (CPP) Committee, and four years on the Royal Commission on the Status of Pensions in Ontario.